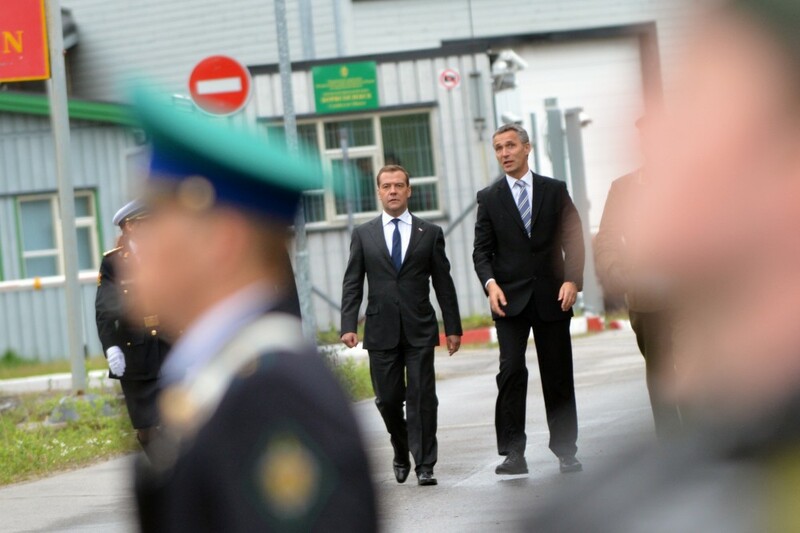 In June 2013 the prime ministers of Norway and Russia, Jens Stoltenberg and Dmitry Medvedev, walk side-by-side across the two countries’ common borderline in the north. Joint efforts to boost business and civil society cooperation were on the agenda. So was possible further steps for liberalization of visa regimes. A year before, in 2012, Norway and Russia opened for visa-free travel for residents living within a distance of 30 km on each side of the border. In Norway, that includes the town of Kirkenes, while it on the Russian side includes the Pechenga District, where both the Northern Fleet’s 200th Separate Motorized Rifle Brigade and the 61st Naval Infantry Brigde are located. 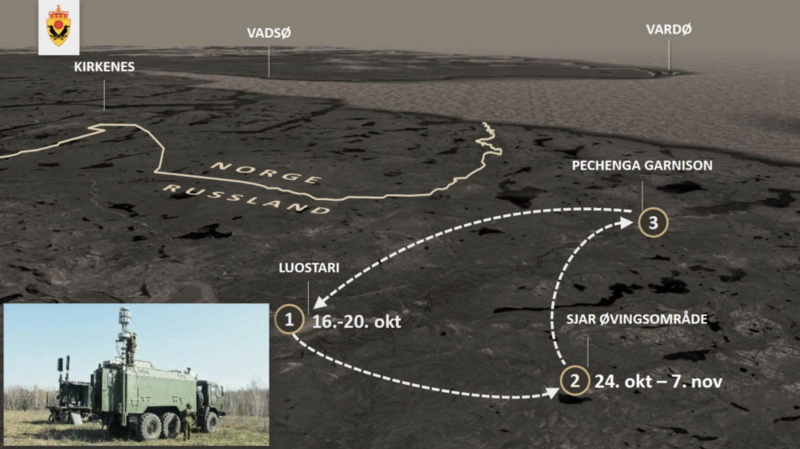 On Monday, Norway’s Director of the Intelligence Service, Morten Haga Lunde, showed a map detailing how his agency believes the military forces in the Pechenga valley interfered with satellite navigation signals over Norwegian air space during NATO’s Trident Juncture exercise last fall. Speaking at the press conference ahead of NATO Defence Ministers meeting in Brussels this week, Jens Stoltenberg was far from smiling. «Taking into account the importance of GPS signals for both civil aviation, not least for search- and rescue, for emergency services, it is very serious when GPS signals are jammed as we have seen in Norway and also in Finland,» Jens Stoltenberg said. The recordings from the press conference is posted on NATO’s portal. «To jam GPS signals is dangerous and irresponsible behavior,» Stoltenberg underscored. As previously reported by the Barents Observer, interference with GPS signals have been discovered five times since autumn 2017 and has caused concern by civil aviationin Finnmark, police and maritime services, as well as private companies in construction businesses. At one occasion, an ambulance plane was hindered to land at one of the smaller airports along Norway’s Barents Sea coast due to lack of GPS signals, TV2reports. The Defense Ministry in Oslo last year confirmed to the Barents Observer that the jamming came from Russian military sources on the Kola Peninsula. In Moscow, though, the Foreign Ministry has repeatedly denied all such accusations. For NATO, jamming of GPS signals without prior warning is a concern not only for the military. «NATO will continue to raise all questions with air safety with Russia. This is undermining our cooperation with Russia related to search- and rescue who also may need help with search- and rescue in the high north,» Jens Stoltenberg said. Search- and rescue in Arctic waters is one of very few arenas where NATO countries and Russia still have cooperation that includes military units. Last spring, the Norwegian Coast Guard and Russia’s Northern Fleet conducted a joint drill in the Barents Sea. In his annual speech (sound recording in Norwegian) for the Oslo Military Society on Monday this week, Lieutenant General Morten Haga Lunde, detailed the scoop of the Russian military jamming in the Pechenga valley and how the jamming gear was moved around in the district around the now closed-down Luostari air base, some 16 km from the border to Norway. A recording of Haga Lunde’s speech about jamming is posted by TV2 (in Norwegian). Here, he shows how the jamming-vehicles were moved around and intensified interference with the GSP navigation signals at the kick-off for Trident Juncture in late October 2018. «This influenced larger parts of the air space over Finnmark» the intelligence director said. «The jamming ceased on November 7th, the same day as Trident Juncture ended,» Haga Lunde said. GPS trouble for passenger aircraft to and from Kirkenes airport worries Norwegians. Also Finland has warned pilots flying north of Rovaniemi of being aware of possible GPS jamming. On Monday, the issue came up when Finnish Foreign Minister Timo Soini visted Moscow. Foreign Minister Sergey Lavrov, however, upheld the denial. «I must say that the matter was not looked into because it is impossible to explore fantasies that are not confirmed by any facts. It’s all along the lines of highly likely,» Lavrov said a the two foreign ministers joint press conference. The Russian Foreign Minister said military officials are ready «to sit at the table together with their colleagues from the respective countries and look into facts of they claim Russia had done. «When there will be facts, we will be ready to talk. Otherwise, all this is not serious,» Lavrov said according to the transcript from the press conference.